We all know him as Bolo, cinema’s most recognisable villain with a menacing physique and steely gaze, but by birth he is Yang Sze and was born on July 3, 1946 in Guangzhou, China. Let’s take a closer look at Asian monster with extremely imposing physique. Yang began training when he was only 10 and studied under several kung fu masters practising Tai Chi and Wing Chun, but growing up, he became more interested in bodybuilding. In the early 1960s, like millions of others, he took part in the “great exodus to Hong Kong” and moved there looking for a better life. Bolo settled into his new life in Hong Kong as a gym instructor. His hard work paid off when he took a title of Mr. Hong Kong which he held for 10 years, winning everything between 1970 and 1980. That’s how he has got his nickname Chinese Hercules. Huge physique and respected position as a bodybuilding instructor landed him several roles at the Shaw Brothers Film Studio in such films as The Heroic Ones, The Deadly Duo, Angry Guest and others. Interesting fact, when Bolo was around 25 he met Bruce Lee while the two were filming a Winston cigarettes commercial, soon they became close friends working on fighting technique for Enter the Dragon. During the 1970-80s Bolo played in numerous kung fu and Bruceploitation films where he appeared alongside ‘clones’ of Bruce Lee, such as Bruce Li, Bruce Le and Dragon Lee. This time he developed his trademark ‘not looking’ style. Chest of a size of two garbage can lids and threatening glare the last thing that every movie hero could remember before Bolo turned them into a whimpering, limping wreck. As the movie’s central villain, he is savaging and killing any opponent that dares to take on him. Bolo’s biggest breakout happened when he was offered a role of Chong Li in Bloodsport in 1988. By this time he was 42 and already played in 69!!! movies. Once again his personality and skills formed a strong friendship with another rising action star Jean-Claude van Damme. Bloodsport was made on a budget of $1,100,000 and grossed $12,000,000 only in US, and I sure still getting some money every year. The real Frank Dux was the fighting coordinator for this film. When Jean-Claude Van Damme was cast, Dux announced that Van Damme wasn’t nearly in good enough shape, and put him through a 3-month training program. Van Damme called those three months “the hardest training of his life”. By the way, Jean-Claude does his trade mark splits a total of seven times during the film. There is one man who dared to take on Bolo and survived! In Bloodsport movie the fighter named Parades, played by Michel Qissi (he also played famous Tong Po in Kickboxer), gets his leg broken, however, throughout the next several scenes he is unhurt and seated on the bleachers. This man is so lucky. Even after Bloodsport was filmed, the movie was almost never released, but Jean-Claude Van Damme helped edit the film so that it could be. Much more interesting fact that Jeff Pruitt was considered for the lead role, but dropped out because of a serious ankle injury. So this movie served as a jumping-off place for two biggest action stars, and who knows where van Damme could be if not a Bloodsport opportunity. 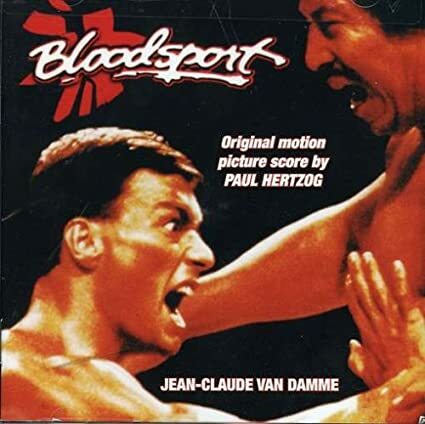 If you are a true fan of Bloodsport this CD is a MUST HAVE! After almost 30 years the full score and soundtrack is available totally uncut and includes the Original song “Fight to Survive” performed by Stan Bush. All cues from the film are represented and are 100% spot on. It is highly recommended for any martial arts fan out there. Hurry only 3000 copies made. Their on-screen chemistry was so successful that the two later teamed up again in Double Impact, where Bolo steals the show as Moon, the villainous one-eyed henchman. The superb final fight scene demonstrates martial arts cinema at its best. Let me answer one question that you have been asking yourself many times: “Why my favourite martial artists stop making any films and where all martial arts movies gone?” The reason why we lost all action heroes at the end of 90s was that top producers of movie industry decided to change films hero look and give Brad Pitt, Keanu Reeves, Johnny Depp and others the carte blanche. That’s it! Simple as it sounds. That’s what we have today. Bolo tried to fulfill his ambition of becoming a movie hero, appearing in two Shootfighter movies, but if you look at him closer you will notice he is clearly out of his comfort ‘villain’ zone. The next time when we saw Bolo was Blizhniy Boy: The Ultimate Fighter in 2007 where he played a small role alongside Cung Le, David Carradine, Eric Roberts and Cary-Hiroyuki Tagawa. But due to legal issues, this film remains unreleased. In 2015 he played another role in The Whole World at Our Feet movie but there is no word will it be released or not. Th movie that made Jackie Chan an action star. The film was a success at the Hong Kong box office, earning two and a half times the amount of Chan’s previous film, Snake in the Eagle’s Shadow, but sure the success can be splitted between Chan, Bolo and Hwang. By the way, did you know movie features Hung Ga, which was historically practiced by Wong Fei-hung and his father, both of whom are major characters in this film. The systems of “Devil’s Kick” and “Devil’s Shadowless Hands” employed by Taekwondo master Hwang Jang-lee are entirely fictitious. According to Chan’s book I Am Jackie Chan: My Life in Action, he nearly lost an eye after his brow ridge was injured. This action comedy directed by Sammo Hung, who also starred in the film alongside Jackie Chan and Yuen Biao. Bolo played a very small role of Millionaire Chan. This film was nominated for the Best Action Choreography at 1986 Hong Kong Film Awards. The first lead role of Brandon Lee and the only Hong Kong production he starred in. Bolo played a cameo in this movie. He had to spend several weeks training Brandon so the young star would appear to be a worthy opponent. In also knows as Shanghai Express Bolo played Cotton weaver, this film united best Asian and Western actors and can be called Asian Expendables. Now you know where Mr. Stallone took his idea from (kidding). You only look at the cast: Sammo Hung, Yuen Biao, Hwang Jang Lee, Eric Tsang, Wu Ma, Yasuaki Kurata, Richard Norton and Cynthia Rothrock. Bruce Lee inspires me to stay strong in times of challenge or trial, because not every day is a sunny day. Family legacy is living on with Bolo’s son David who is professional bodybuilder too and now tries to breakthrough into the movies. What is interesting he was born on the same day as his father – July 3, but in 1974 of cause. He started practising Tai Chi at the age of 5 and martial arts at age 7. As he has a weak body Bolo decided to take him to the gym to start weight training and at age 14 he already competed in his first teenage bodybuilding competition. David won Mr California title in 1998. At 23 years old at a bodyweight of 84kg he could do 184kg squats for 20 reps! Now David is a personal trainer and used to work with such legends as Magic Johnson, Sean Jones, IFBB pro bodybuilder Flex Wheeler, Hollywood actor Rico Mcclinton and others. Look at him in the 70’s he was huge and could fight, I want to bring that kind of impressionability back. If you would like to find out more about David you are welcome to look up on his Facebook page, YouTube channel and Instagram account. Here is the interesting video with deleted scenes of David’s fighting skills. Here is Van Damme and Bolo Yeung at Budo Gala 2010 in Basel. In 2011 Jean Claude’s son Kris has arranged a family meal at a restaurant and has secretly invited Bolo to surprise his father. You can watch the video below. And here is Bolo Yeung visiting the Fitness Club on 16 May 2011 in Russia. And here is a really rare footage of Bolo on Russia TV. Here is the photos of Bolo Yeung alongside legendary cast of Enter The Dragon – Bob Wall, Jim Kelly, and John Saxon. They all were inducted into the Prestigious All-Pro Tae Kwon Do’s Hall of Fame in 2012. And here is the photo of Bolo and Lady Dragon herself Cynthia Rothrock. 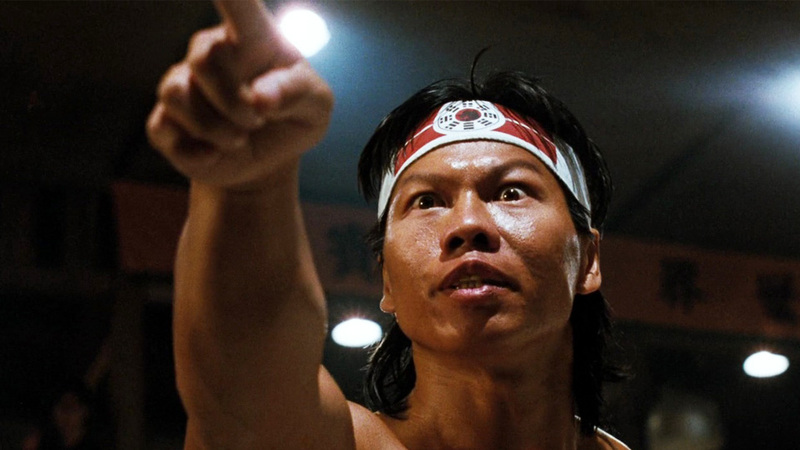 Bolo Yeung currently lives in Monterey Park, Los Angeles, and has a daughter Debbra and two sons, Danny and David. He still trains regularly, practicing Tai Chi and weightlifting, and holds a managerial position at The Tapei International Federation Of Body Builders squad and a chairman of The Hong Kong Gym Business Association. Despite being a kind and generous family man off-screen, it is the menacing roles that best display his formidable talents on-screen, and no-one can doubt his contribution to Kung Fu Cinema and his reputation as one of the toughest bad guys around. If you are interested in Bolo you can find his Fan page on Facebook, profile pages on Rotten Tomatoes, Wikipedia, Fandango, iMDB and even Russian Fansite.